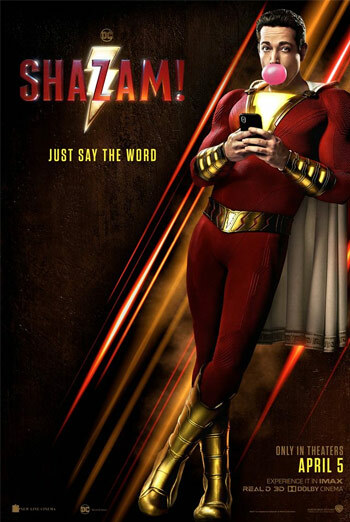 Landmark Cinemas Canada “SHAZAM!” Web Contest (the “Contest”) is conducted by Landmark Cinemas Canada Limited Partnership (the “Sponsor”), and is only open to individuals over the age of 18 as of the date of their entry into the Contest and who are legal residents of BC, AB, SK, MB, ON, and YT, except (i) the employees of Landmark Cinemas Canada, its affiliates, each of their licensors associates, and participating Landmark Cinemas Canada locations, and each of their respective advertising and promotional agencies, prize suppliers including, without limitation, Warner Bros. Entertainment Canada Inc. and its affiliates), and their respective agents or representatives; (ii) contest judges; and (iii) persons domiciled with any of the above or members of the immediate family (defined as parents, siblings, children and spouses, regardless of where they live) of any of the above. The entities listed in (i) and (ii) shall collectively be referred to as the “Group.” If a participant is an eligible minor in his or her jurisdiction of residence, his or her parent or legal guardian must consent to such minor’s entry and hereby agrees to these Rules along with and on behalf of his or her minor child. All rights and responsibilities of a minor under the Rules are conferred and assumed respectively by the minor’s parent or legal guardian in representation of the minor. Warner Bros. Entertainment Canada Inc. (“Prize Provider”) its parent, affiliates, and subsidiaries are not responsible for the promotion, administration, or execution of the Contest or the selection of winners. By entering this Contest, you agree to completely release Warner Bros. Entertainment Canada, Inc. and its parent, affiliates and subsidiaries from any liability. This Contest begins at 7:01:01 am (MT) on April 4, 2019 and closes at 11:59:59 pm (MT) on April 28, 2019 (the “Contest Period”). NO PURCHASE NECESSARY. If you choose to enter the Contest using a mobile phone, standard data fees may apply; no other costs or other obligation will be incurred by entering the Contest. On April 29, 2019 at approximately 10:00 am (MT), at 36560 60 Av SE, Calgary, Alberta, the official contest computer will randomly draw five (5) entries from all entries received to identify five (5) potential winners of the prizes described below (each a “Prize”). The first five (5) entries drawn will be eligible to win a SHAZAM! Prize Pack which consists of one (1) SHAZAM! T-Shirt, one (1) SHAZAM! Beanie, one (1) SHAZAM! Pin, and one (1) SHAZAM! Mini Poster. The Prize value is approximately $44.00 CDN each. Prizes must be accepted as awarded and may not be substituted, transferred or redeemed for cash or otherwise. Sponsor reserves the right, at its sole discretion, to substitute a prize of greater or equivalent monetary value if the Prize or any portion thereof cannot be awarded for any reason. Sponsor will not replace any lost or stolen components of the Prizes. If any individual under the age of majority in the province/territory of their residence wins a Prize, the Prize will be awarded to the parent or legal guardian of the selected entrant, provided such parent or legal guardian accepts the Prize as awarded, and complies with these Contest Rules. The Sponsor will email the potential winners of the Contest. If a potential winner does not respond to the Sponsor’s attempt to contact them within seventy-two (72) hours, he/she will be deemed to have forfeited his/her chance to win a Prize. In the event that the potential winner is disqualified for any reason, the Sponsor may award the applicable Prize to an alternate winner in a random drawing from among all remaining eligible entries. Only one (1) alternate potential winner may be drawn for each Prize after which the Prize may not be awarded. Before being declared a Prize Winner, the selected entrant signing a declaration confirming understanding, compliance with, and acceptance of the Contest Rules and acceptance of the Prize. Each Prize Winner must also sign a publicity release and a release of all liability arising directly or indirectly out of the Contest and the Prize satisfactory to the Sponsor (a “Release”). Winner must agree to look to the manufacturer of any Prize for any warranty issues, not the Sponsor. By accepting a Prize, the winner agrees to use of his or her photograph, name, address, likeness, voice, and statements in any publicity carried out in connection with the Contest, the Prize, or awarding of the Prize by the Sponsor, its suppliers and their affiliates, agents or such other designated parties without remuneration. NO PURCHASE NECESSARY. Open to residents of BC, AB, SK, MB, ON, and YT, 18 years or older. Limit one (1) entry per person per day. Mathematical skill testing question required. Odds of winning are dependent upon total number of entries received during the Contest period. The first five (5) entries drawn will be eligible to win a SHAZAM! Prize Pack which consists of one (1) SHAZAM! T-Shirt, one (1) SHAZAM! Beanie, one (1) SHAZAM! Pin, and one (1) SHAZAM! Mini Poster. SHAZAM! and all related characters and elements © & ™ DC Comics and Warner Bros. Entertainment Inc.